The hotel and staff were fantastic. The service was superb. The room was exceptionally clean and well maintained. incredible once again. the best hotel in the world. Beautiful and very clean hotel with professional staff who made sure our accommodations were of the highest quality. I had. Avery god experience at the Four Seasons Las Vegas. Very friendly and courteous staff and the service was outstanding. nice Hoel, good service, staff really helpful, I definitely will come back. Very nice. Located on the top floors of Mandalay Bay. All the personnel we encountered from the valet, front desk, security and pool attendants were professional and very pleasant. My family was very impressed, especially my wife on her birthday! Truly the best! Very memorable experience for us ... priceless! After running around Vegas, it’s always nice to return to a place that’s completely civilized. If you have a room on the airport side, don’t miss watching Janet Airlines. The staff was very engaging; each staff took the time to greet each guest and ensure that service was promptly provided. Best service I've received since traveling to Ireland in June 2017. We make a trip to Las Vegas almost every year. We discovered this secret hide-away a few years ago. At the end of the strip across from the airport on top of the Mandalay Bay Hotel. We have stayed there four times over the last four years. Everything about the stay at this hotel from start to finish is excellent. The Four Seasons prides itself on customer service and they certainly deliver. We have stayed at the Four Seasons in Denver and it earned 1,000 stars. Amazing. Our stay was nearly flawless. The flaw seems so trivial looking back that it feels like it never existed. The Four Seasons is more than a hotel stay; it's an experience. An experience we're still savoring. We can't wait to do it all again, but this time with the kids!!! The hotel rooms were excellent. But the hotel is so hard to find. The building is shared between multiple hotels, and Four Seasons occupies the back entrance of the building. Signage is lacking on the building, and directions minimal on the road. We did 4 loops around the block to find it. Uber and Lyfts also get confused too. 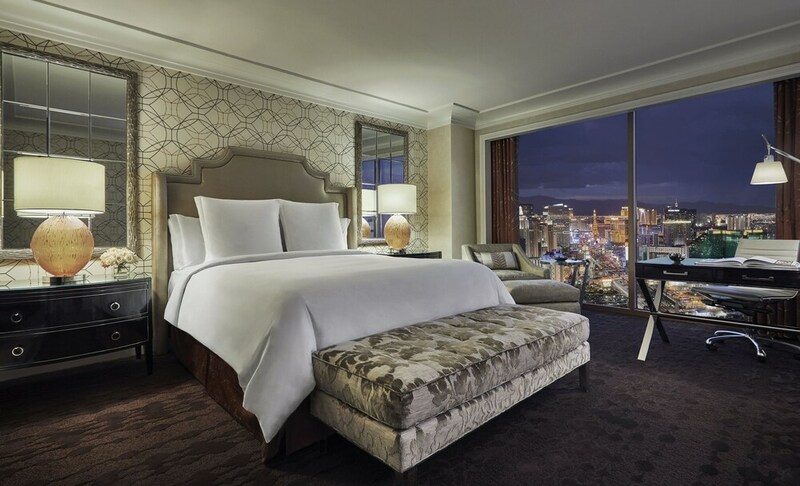 Located in Las Vegas Strip, Four Seasons Hotel Las Vegas is within 2 miles (3 km) of popular attractions such as Crystals at City Center and Town Square Las Vegas. This 424-room, 5-star resort has conveniences like a full-service spa, an outdoor pool, and a 24-hour fitness center. It's connected to the convention center in central Las Vegas and also close to Thomas and Mack Center and Fashion Show Mall. Enjoy dining at one of 2 onsite restaurants including Verandah, which specializes in Italian cuisine. Savor a meal from the comfort of your room with 24-hour room service, or get a quick energy boost at the coffee shop/café. Guests can expect WiFi and 42-inch an LCD TV with pay movies. Beds are dressed in premium bedding and down comforters, and the bathroom offers a hair dryer and designer toiletries. Other standard amenities include an iPod dock, a minibar, and a coffee maker. Guests of Four Seasons Hotel Las Vegas enjoy a full-service spa, an outdoor pool, and a lazy river. Valet parking is available for USD 32.00 per day, and there's also limo/town car service. The front desk has multilingual staff on hand 24/7 to help with securing valuables, tours or tickets, and dry cleaning/laundry. Other amenities at this luxury resort include a 24-hour fitness center, a spa tub, and a steam room. Thank you for your lovely review and kind compliments to our staff, the superb service they provided as well as our rooms. We hope to welcome you back to our hotel again in the near future. . Thank you for your compliments to the food, great views, non-gaming atmosphere and poll. We hope you will be back to see us again soon. Thank you for your five star rating. We hope to have future opportunities to welcome you back. Wow! Thank you for your amazing compliment of our hotel as "the best hotel in the world". I am so grateful for your review and we look forward to your return soon. Thank you for your five star rating. We hope to welcome you back again in the near future. We appreciate your rating and are glad that you enjoyed your stay. We hope to welcome you back again soon. We are grateful for your five star rating and hope to welcome you back at our hotel again soon. We appreciate you taking the time to write a review and post a photo of your recent stay. Thank you for your kind compliments to our staff. We hope to see you back at our hotel again soon. We are so glad to hear that you had a great experience at our hotel. Thank you for your kind compliments to our staff and the outstanding service they provided. We hope to welcome you back soon. We are grateful for your kind compliments to our hotel, staff and the service they provided. We look forward to your return soon. Verandah - Pool-view restaurant and bar specializing in Italian cuisine. Open for breakfast, brunch, lunch, and dinner. Alfresco dining available (weather permitting). Charlie Palmer Steak - Steakhouse and bar open select days for dinner. The resort has an outdoor pool and a spa tub. A lazy river, a steam room, and a 24-hour fitness center are other recreation options.